Ninety-two percent of respondents in a recent poll of one thousand Egyptians over 18 years of age called Israel an enemy state. In contrast, a meager 2% saw Israel as "a friend to Egypt." These hostile sentiments express themselves in many ways, including a popular song titled "I Hate Israel," venomously antisemitic political cartoons, bizarre conspiracy theories, and terrorist attacks against visiting Israelis. Egypt's leading democracy movement, Kifaya, recently launched an initiative to collect a million signatures on a petition demanding the annulment of the March 1979 Egypt-Israel peace treaty. Also, the Egyptian government has permitted large quantities of weapons to be smuggled into Gaza to use against Israeli border towns. Yuval Steinitz, an Israeli legislator specializing in Egypt-Israel relations, estimates that fully 90% of PLO and Hamas explosives come from Egypt. Cairo may have no apparent enemies, but the impoverished Egyptian state sinks massive resources into a military build up. According to the Congressional Research Service, it purchased $6.5 billion worth of foreign weapons in the years 2001-04, more than any other state in the Middle East. In contrast, the Israeli government bought only $4.4 billion worth during that period and the Saudi one $3.8 billion. Egypt ranked as the third largest purchaser of arms in the entire developing world, following only population giants China and India. It has the tenth largest standing army in the world, well over twice the size of Israel's. 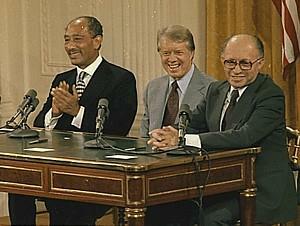 Egyptian president Anwar El-Sadat, U.S. president Jimmy Carter, and Israeli prime minister Menachem Begin in a good mood at the Camp David Accords signing ceremony, Sep. 17, 1978. This long, ugly record of hostility exists despite a peace treaty with Israel, hailed at the time by both Egypt's president Anwar El-Sadat and Israel's prime minister Menachem Begin as a "historic turning point." U.S. president Jimmy Carter hoped it would begin a new era when "violence no longer dominates the Middle East." I too shared in this enthusiasm. With the benefit of retrospect, however, we see that the treaty did palpable harm in at least two ways. First, it opened the American arsenal and provided American funding to purchase the latest in weaponry. As a result, for the first time in the Arab-Israeli conflict, an Arab armed force may have reached parity with its Israeli counterpart. Second, it spurred anti-Zionism. I lived for nearly three years in Egypt in the 1970s, before Sadat's dramatic trip to Jerusalem in late 1977, and I recall the relatively low interest in Israel at that time. Israel was plastered all over the news but it hardly figured in conversations. Egyptians seemed happy to delegate this issue to their government. Only after the treaty, which many Egyptians saw as a betrayal, did they themselves take direct interest. The result was the emergence of a more personal, intense, and bitter form of anti-Zionism. The same pattern was replicated in Jordan, where the 1994 treaty with Israel soured popular attitudes. To a lesser extent, the 1993 Palestinian accords and even the aborted 1983 Lebanon treaty prompted similar responses. In all four of these cases, diplomatic agreements prompted a surge in hostility toward Israel. Defenders of the "peace process" answer that, however hostile Egyptians' attitudes and however large their arsenal, the treaty has held; Cairo has in fact not made war on Israel since 1979. However frigid the peace, peace it has been. To which I reply: if the mere absence of active warfare counts as peace, then peace has also prevailed between Syria and Israel for decades, despite their formal state of war. Damascus lacks a treaty with Jerusalem, but it also lacks modern American weaponry. Does an antique signature on a piece of paper offset Egypt's Abrams tanks, F-16 fighter jets, and Apache attack helicopters? Once signed, agreements signed by unelected Arab leaders would convince the masses to give up their ambitions to eliminate Israel. These agreements would be permanent, with no backsliding, much less duplicity. Other Arab states would inevitably follow suit. War can be concluded through negotiations rather than by one side giving up. The time has come to recognize the Egypt-Israel treaty – usually portrayed as the glory and ornament of Arab-Israel diplomacy – as the failure it has been, and to draw the appropriate lessons in order not to repeat its mistakes. Nov. 21, 2006 update: I continue writing on this topic at "The Egypt-Israel 'Peace' Treaty: Updates." Related Topics: Arab-Israel conflict & diplomacy, Egypt, Israel & Zionism | Daniel Pipes receive the latest by email: subscribe to the free mef mailing list This text may be reposted or forwarded so long as it is presented as an integral whole with complete and accurate information provided about its author, date, place of publication, and original URL.